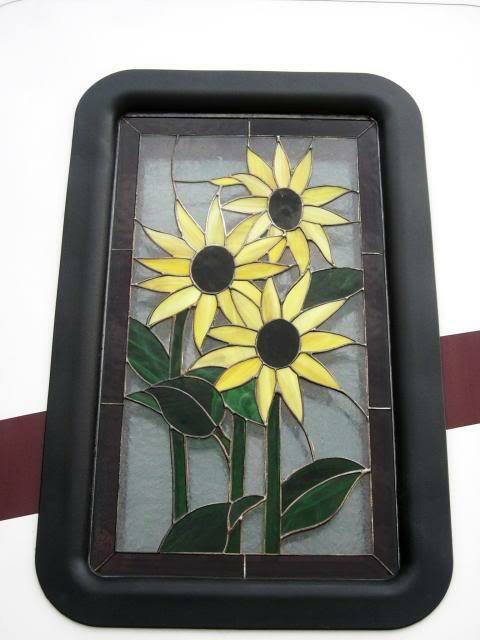 If you are interested in inexpensive stained glass, then try to attend the MOC "Circling of the Montanas" rally in Quartzsite. There will be a day trip to El Algondones for those who want stained glass windows (and other specialties provided there). Best of all, we have an experienced crew of installation experts who can help you perfectly install that bad boy. As Hookman indicated, some negotiating will get you a window in the $45 price range. The only bad news is for those with the newer Montanas with the larger entry door window (late 2010 and 2011??). The old world's craftsman in Mexico (and you thought they were all in Goshen?) hadn't figured out there are new sizes when we were there last year. There is more to life than fuel mileage. Haven't been south of the border in awhile, do you need a passport now? Yes, so come on down and join us. Algodones for us, too. $42 after negotiating. This is not a real good picture. But it reflects our Kansas heritage. No passport needed to cross into Mexico, but you'll need it or a passport card if you want to come back over.